In September 2008, Water By Nature was proud to be involved with Ginger TV and their filming of ITV – Jack Osbourne – Celebrity Adrenaline Junkie, Series 4. Jack Osbourne was joined by Elijah Wood, for a two and a half day trip down the Zambezi River to Moemba Falls. The journey takes in all the best rapids including “Stairway to Heaven, The Midnight Diner, The Mother, Oblivion, Open Season and Upper Moemba.” Although we don’t want to spoil the show for you, we can let you know that there was some “action” at one point on the trip for Jack and Elijah. Elijah Wood, famed for his many movie roles including “Back To The Future Part 2” but more noteably as Frodo in “Lord Of The Rings”, had never camped before, but by the end of the trip was a convert, sleeping out under the stars for the duration of the river trip. This trip is un-doubtedly, one of the most filmed Zambezi River trips, with views from the river bank, on-board cameras, helmet cams on Jack and Elijah and footage taken by helicopter as well. 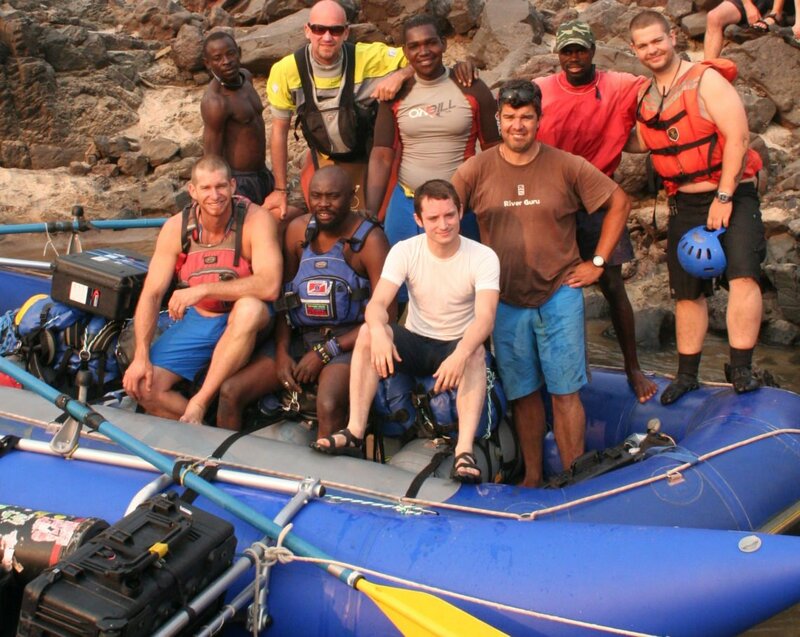 Whether you are a past Water By Nature Zambezi client and want to re-live the rapids, or a potential first timer to rafting, this will give you a real insight into this world classic of river journeys. Jack Osbourne, in his own right has completed some incredible challenges in the Adrenaline Junkie series to date, including climbing El Capitan in Yosemite National Park, kick boxing in Thailand and Bungy Jumping in South Africa. Jack had never been rafting before and relished in the challenge of taking on the world’s best river. Despite kayaking in a tandem kayak on New Zealands Kaituna River, his experiences document what its like for a first timer to conquer such a mammoth challenge. Elijah was also a first time rafter, however as with Jack he took on the challenge with plenty of enthusiasm and loved every moment of the trip. In addition to the rafting trip, Jack and Elijah did a tyrolean traverse from Victoria Falls side of the falls to the Zambian viewing side of the falls. You will also see other activities in the area including a gorge swing and microlight flight. For anyone who has a week spare and the urge for a world class adventure, Water By Nature has Zambezi Blast trips running from August until November. Not only will you get the full experience of Jack and Elijah, but in addition, an amazing 3 day safari to Botswana after your rafting trip.